The Totoro Forest Project Benefit auction day is approaching, and everybody involved has been working hard to get everything ready. I was recently asked to assist and for the past couple of weeks I have been helping Dice Tsutsumi, Enrico Casarosa and Andy Wang with some web maintenance duties, analytics / SEO. 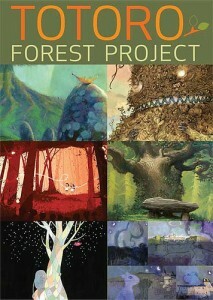 I also help them set up the new Totoro Forest Project blog, so I have been busy some of the evenings/weekends as well. If you have not had a chance to visit the new Totoro Forest Project blog, you are missing quite a lot of cool information, they said they will be posting all kinds of interesting information as the date for benefit auction approaches. Needless to say the techie side has taken over the artistic side (I have not sketched anything lately) and with Sketchcrawl 20th approaching (date to be determined), I know I need to get into shape. I have however been reading that book I mentioned a couple of posts ago and I can say it looks very good, now I just need to try the exercises. I also took a few pictures I wanted to share with you, unfortunately my wife’s computer experienced a glitch and I had to deal with that (her computer is hooked up to the scanner, the printer and the digital camera), lucky person uh? 🙂 By the way if you have not had a chance please visit her blog, she is constantly posting all kinds of goodies as well that I am sure you would appreciate and she would also love to hear from you. What is the Totoro Forest Project? It is an international fundraising exhibition/auction event to support the non-profit Totoro no Furusato Foundation (Home of Totoro) established by Hayao Miyazaki. What is exactly the Totoro no Furusato Foundation? Well, it is a non-profit foundation as mentioned above created with the purpose to preserve the beautiful natural habitat of Sayama Hills which is located about 24 miles from the Tokyo Japan metropolitan area. Sayama Hills is the location that inspired Hayao Miyazaki to write/create “Tonari no Totoro (My Neighbor Totoro)” in 1988. If you have not seen this movie, you must see it. Over 200 top international artists that work in different mediums have donated work specially created for this event. The benefit auction will be held at Pixar Animation Studios on September 6th, 2008, a book will be available at this event as well that contains all the work that was donated. There will also be a special exhibition of selected artwork from the auction at the Cartoon Art Museum in San Francisco, California from September 20th to December 7th 2008. I already spotted a couple of pieces that would be nice to have in my room, who knows maybe I will get to own a piece of artwork, or maybe I wont be so lucky and will have to just donate some money to the cause. Please share this info with everyone you know, and if you live locally maybe we will run into each other at one of these events. More information found at: Totoro Forest Project and Enrico Casarosa’s blog announcement.